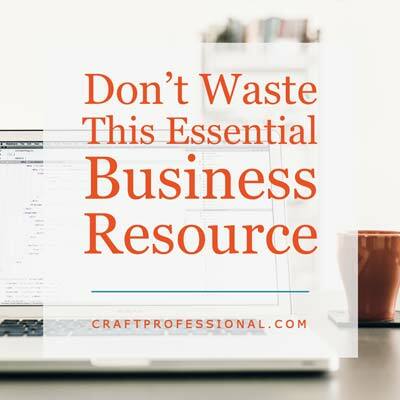 Do you want to build your craft business, but you feel there's always too much to keep track of? 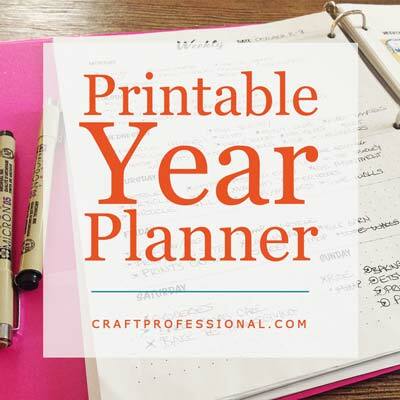 If you're anything like me, you worry about missing important dates and struggle to stay one step ahead of the seasonal nature of the business. The Weekly Craft Business Challenge will help you stay on top of all of that. These things can sneak up on you if you don't have some gentle reminders in place. Each week I'll publish a new set of craft business tips - timely reminders of things you should be thinking of or working on in that moment. 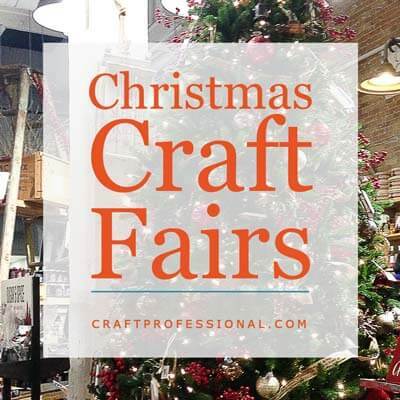 Did you remember to find the application deadlines for craft shows and studio tours that interest you? I'll remind you in January. How's your booth looking? I'll send you craft booth inspiration in the spring and summer when you need to create or spruce up your display. Start any time you like. I'll post updates once a week, every week. You can jump in whenever you're ready. You don't have to wait until the beginning of the year to get started. How Do I keep Up With the Weekly Craft Business Challenge? Each week, I'll post a new set of reminders here, on the website. It's tough to remember to check a website every week, so I'll also send the reminders out each week as part of the newsletter I publish for this site. 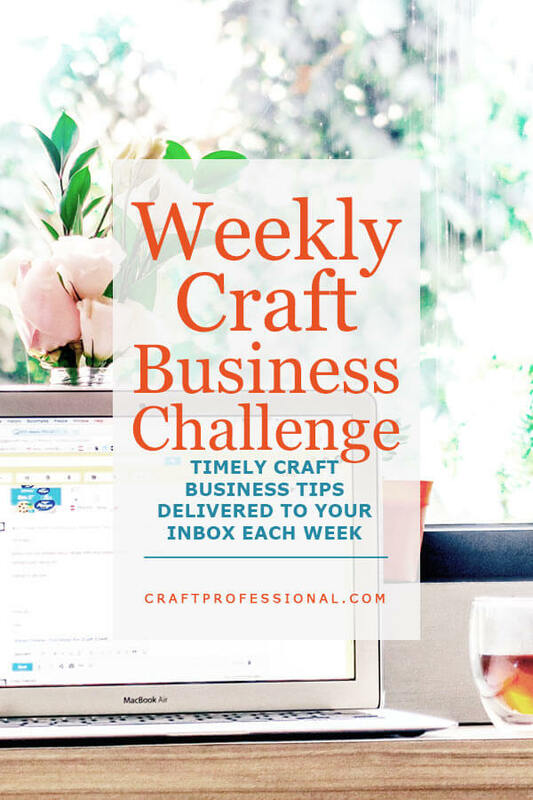 You can sign up to receive the free Weekly Craft Business Challenge reminders, as well as other craft business tips and news in your inbox by completing the form below. Below is a list of all of the craft business challenges. I'll add to the list each week. You can come back to review any of the challenges whenever you like. Start the year off right by committing to better goals. If you're going to launch the new year with new goals, they ought to be ones that will actually move your business and your life in the direction you want. Don't waste time with ineffective goals. Here's how to set better goals. Your habits play a huge role in your outcomes. Many of those goals and resolutions you've set for the upcoming year are largely dependent on developing habits that incrementally build to a larger achievement. Happily, you're not stuck with the habits you have. You can cultivate your habits, strengthening those that help and eliminating those that hurt. This week, we'll look at how to cultivate more helpful habits to support your business and personal goals. Week 3: Craft Show News! 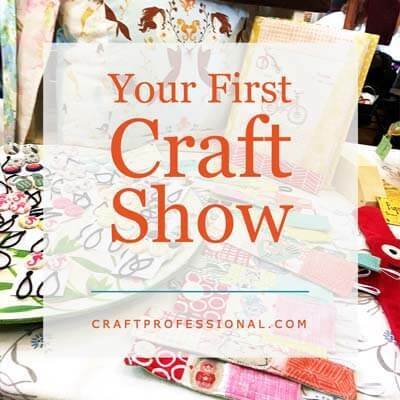 Do you have your applications ready for this year's craft shows? If you haven't already started to think about them, it's time to get moving. This week I have loads of tips to help you make the best impression with your juried art show applications. Resources to help you get better product shots for applying to juried art shows, selling your crafts online, and sharing on social media. Whether you need to edit photos for craft show applications, your online shop, or social media posts, there's a photo editing tool that will fit your needs and your budget. This week we look at image editing software and apps to get your images looking great. Week 2: Get Your Priorities Straight! You can't do it all, so prioritizing certain projects and goals, while letting others go is essential. Here are lessons I've learned about how to choose what to keep, and how to let go of the rest. 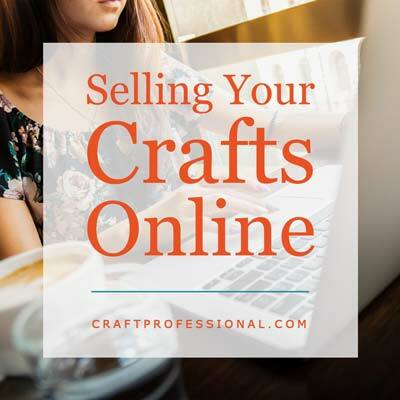 When naming your craft business, not only do you need to consider finding a name that's the right fit, but also, confirming you've covered your bases legally, and ensuring you protect your ownership of that name online. Here's how to get started naming your business. 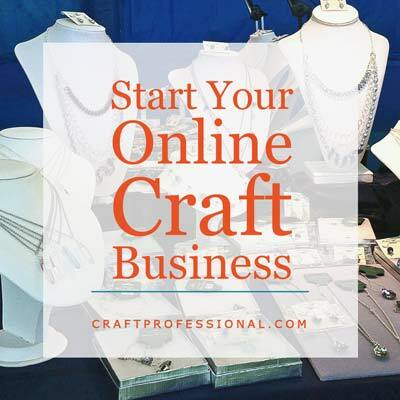 Develop a new income stream for your craft business by offering craft classes. This 5 part series will help you get started. You can't be all things to all people, but if you narrow your focus to a group of customers that you can serve spectacularly well, then you have something you can work with. Here's what you need to know to focus your efforts and apply niche marketing concepts to your own business. Here are plenty of photos of clever jewelry display ideas to help with your own display design. There's everything from commercially available stands to DIY displays. Plus, do you need to buy a craft tent for the upcoming season? 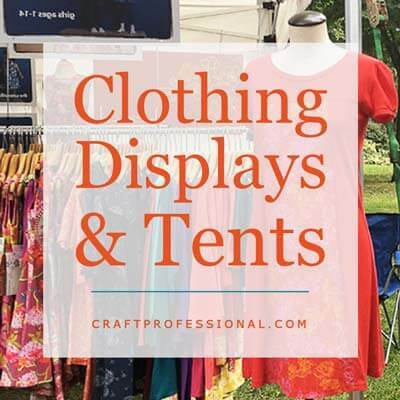 I've compiled everything I know about buying a portable canopy for craft shows to help you do your research and make the right choice to your needs. 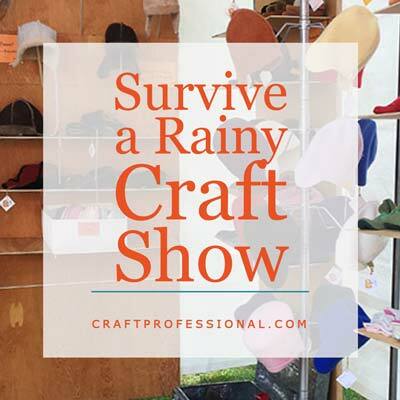 16 accessories booth photos, a helpful tool to make choosing the right craft tent much easier, and 6 tips to help you make the most of your next craft show. Spring studio tours are just around the corner. Here's how to prepare to make the most of your day if you're participating in your local art studio tour. Plus, how to banish distractions from your working hours so you can focus deeply on your most challenging and valuable projects. 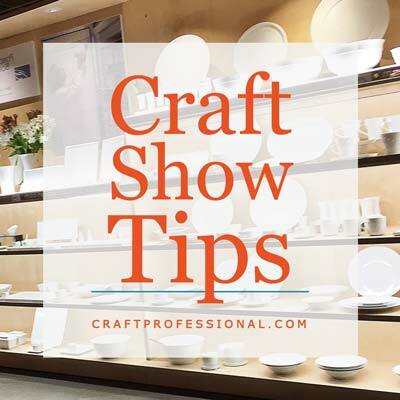 This week we focus on preparing for craft shows with plenty of craft booth lighting photos and resources to get your display in top shape, a craft show packing list, so you don't forget anything, and shade options for irregularly shaped outdoor booth spaces. 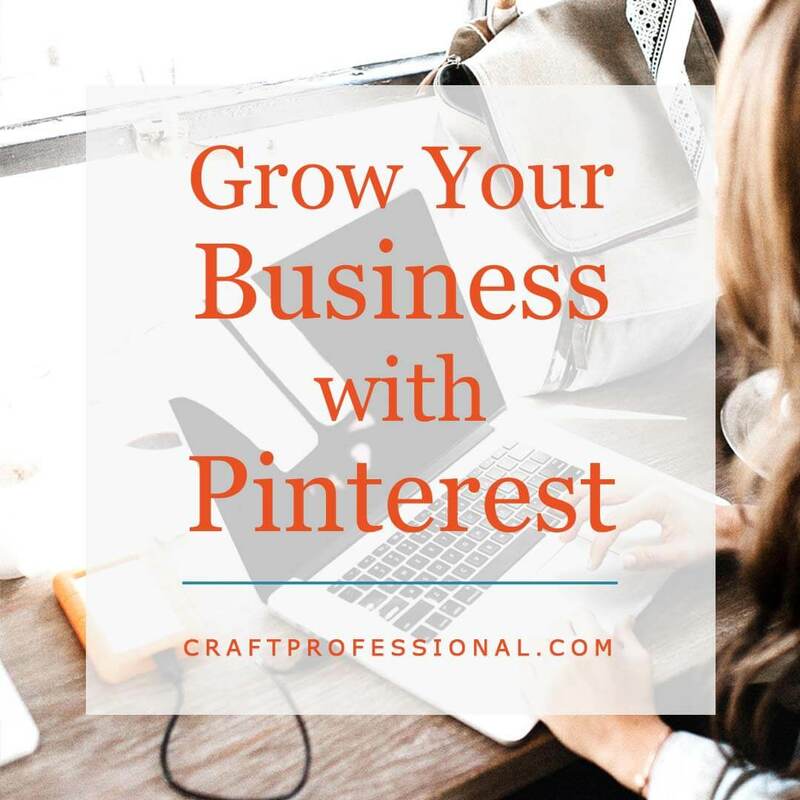 Pinterest provides an excellent opportunity for craft business owners who want to promote and sell their crafts online. This week, we'll look at the first 5 articles in my new Pinterest business marketing series, so you can start taking advantage of this excellent strategy for bringing traffic to your website or online shop. 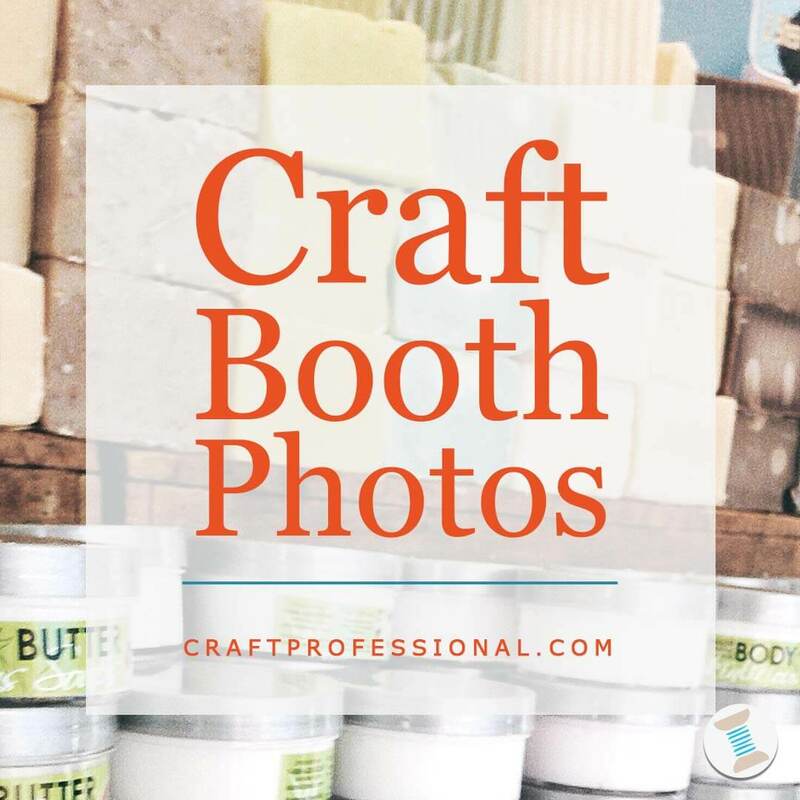 Get your craft booth looking great with inspiration from these 18 craft booth photos. 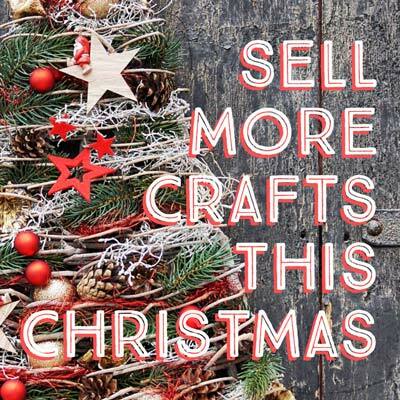 Plus, check out a very popular craft tent, and learn how to make your website irresistible to pinners on Pinterest. If you promote your craft business online, you need to be active on social media. 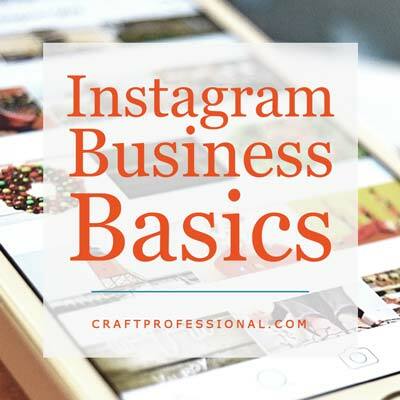 This week, we look at how to promote your business on Instagram, whether Pinterest is the right marketing venue for your business, and how to take great photos and write persuasive copy. Do you feel the standard rules of good craft booth design don't work for your product or your booth space? Here are ways to break the rules and still create an effective display. 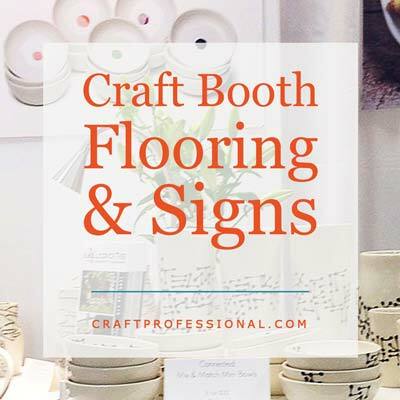 Effective booth signs to help you communicate better with customers at craft shows, portable flooring options for your booth, and a simple but important craft tent buying tip. 11 portable clothing booth photos show you how to use commercial racks in your clothing display, and where to find racks for your own booth. Plus, help deciding whether it's time to invest in a craft tent for outdoor shows. Build a better clothing display with inspiration from these 8 booth photos. 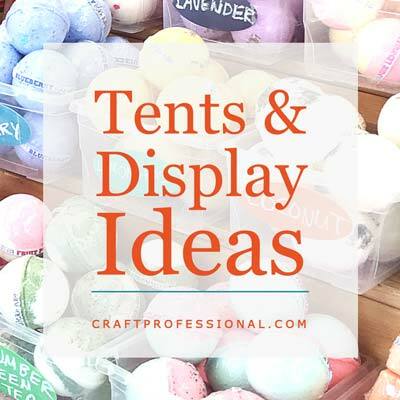 Plus entice customers by designing a craft booth that tells a story, and a reader shares how she found a craft tent that she loves. The only thing worse than a day at a rainy craft show is a day at a rainy craft show in a leaky tent. Here's how to prep your craft tent to reduce the risk of leaks. 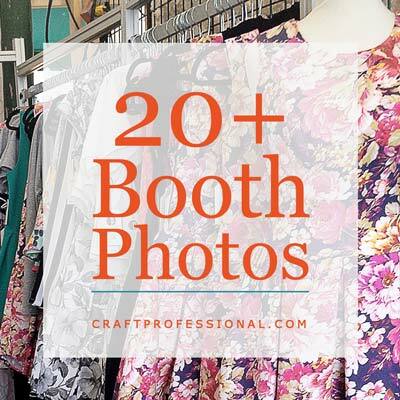 Plus, make your booth bright and whimsical with ideas from 8 children's clothing booth photos. Also, don't be a craft show rule breaker. My printable craft booth regulation checklist will help ensure your booth is in line with the rules of shows you attend. 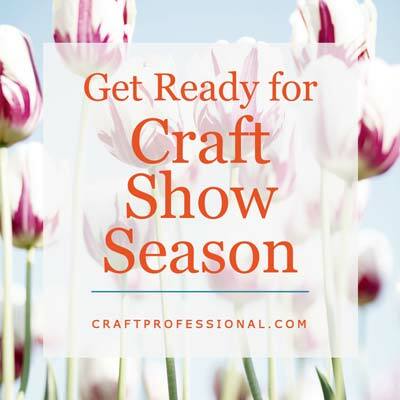 Those who do shows are about to dive deep into summer craft show season and many are putting together or improving upon display booths. This first week of June, we'll focus on getting your booth in shape. 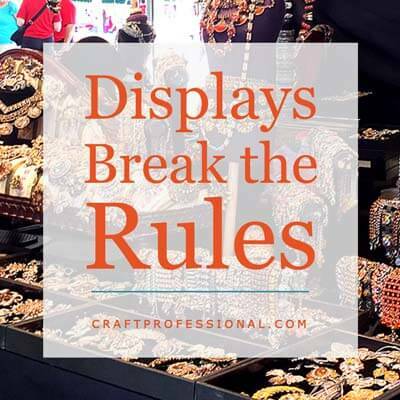 This week features 26 photos of craft show booths including tabletop displays, handbag displays, and tips for keeping your booth simple so your display doesn't out-shine your products. 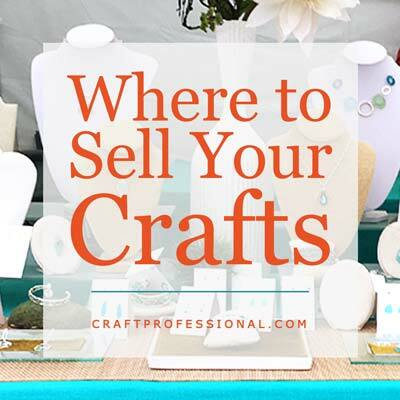 Brainstorm venues for selling your crafts beyond the typical craft show. Tips for selling on consignment, and promoting your business to tourists. The days leading up to Independence Day celebrations in the U.S., seemed like a perfect time to reflect on and celebrate the source of my own independence. 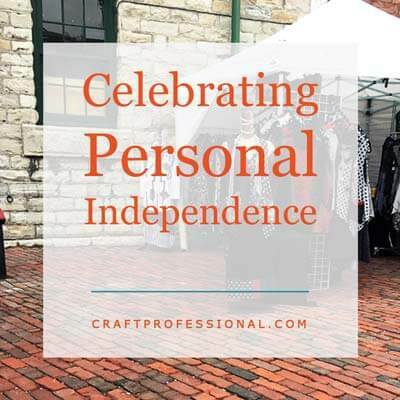 Our businesses can bring us our own personal independence, and this week, I'm sharing the story of how I built my business and my independence. Check out these fabulous soap displays. Plus, a popular and affordable craft tent reviewed. 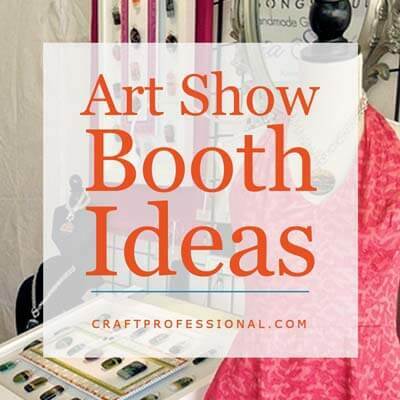 How to find ideas for your craft booth in local retail shops. 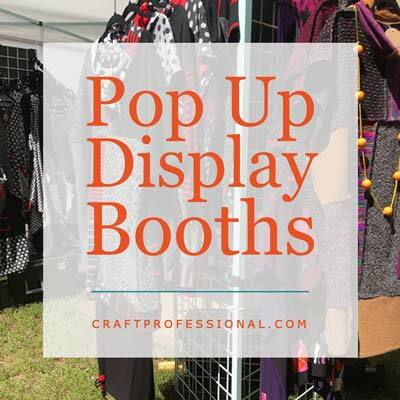 Plus, check out a craft tent brand that's very popular with craft business owners. It's mid-summer, and if you sell at shows, you're deep into craft show season. To help you make the most of the shows you attend, check out tips on choosing lighting for your craft booth, see 11 clothing booth photos, and learn about securing your portable canopy with tent weights. 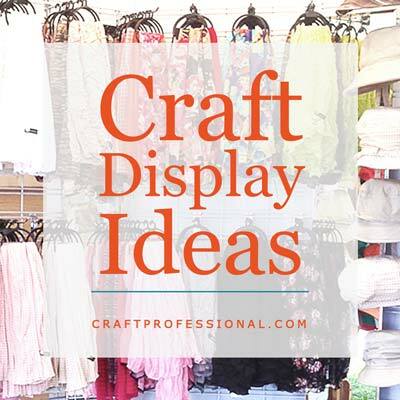 Tips to help you create a brand new display for your first craft show. 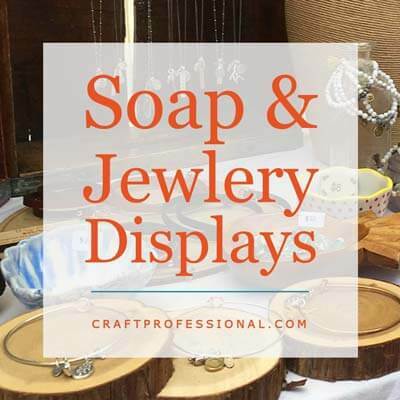 Smart solutions for displaying soap and jewelry at shows. Plus, how to use portable shelves in your craft booth. How to create a portable display using gridwalls, plus 10 tips to ensure your display is practical, functional, and safe. Also, important features to look for when you buy a craft tent. 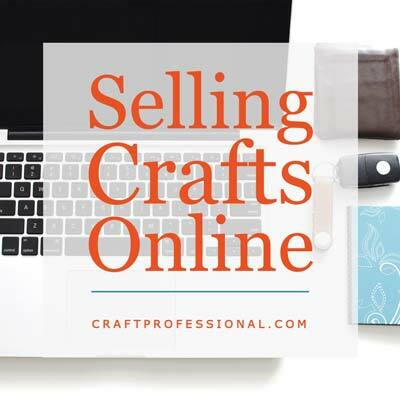 The fundamental decision you'll make before you start selling crafts online is where will you sell. Will you invest in building your own site, or will you sell on a third party site? We'll look at the pros and cons of each option this week. Plus, learn how to make sure you are really in control of your online business. Slat Wall Display Photos & Lessons from Retail Displays. 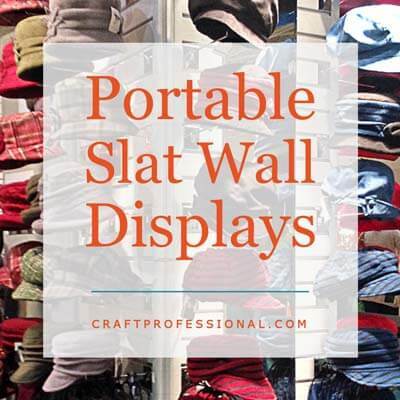 Examples of slat wall displays in craft booths, plus, learn some fundamental lessons in merchandising from this indie retail shop. Booth setup and tear down times pose the biggest risk for theft at craft shows. Reduce that risk with a booth design that quick and easy to assemble and tear down. For those who want to launch an online business, there are a lot of services that simply don't deliver and end up wasting your time and money. I do have one resource that it completely worthwhile and will help you build an actual business, not just a pretty website. Bonus - It's on sale the first week of July! 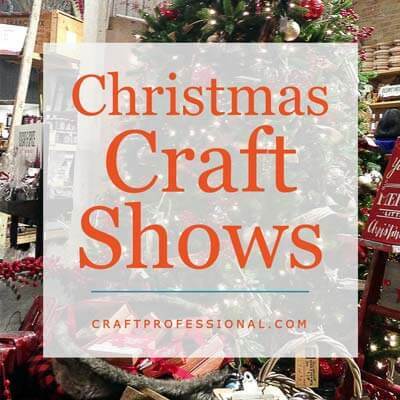 Christmas craft show season will be upon us sooner than you realize. Get your booth ready for the holiday season with inspiration from 10 beautiful Christmas craft show displays and printable signs for your Christmas craft booth. A business newsletter is a smart and inexpensive (possibly even free) way to market your business with online and off-line customers. Want to start a newsletter for your business? 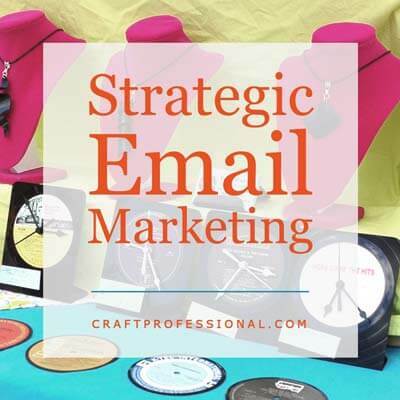 Check out my 8 part email marketing series first. Christmas craft show season is right around the corner, but there's still time to spruce up your booth and get it ready for the holiday season. I have plenty of photos or craft displays at Christmas craft shows to inspire you to get your own booth ready for the festive season. 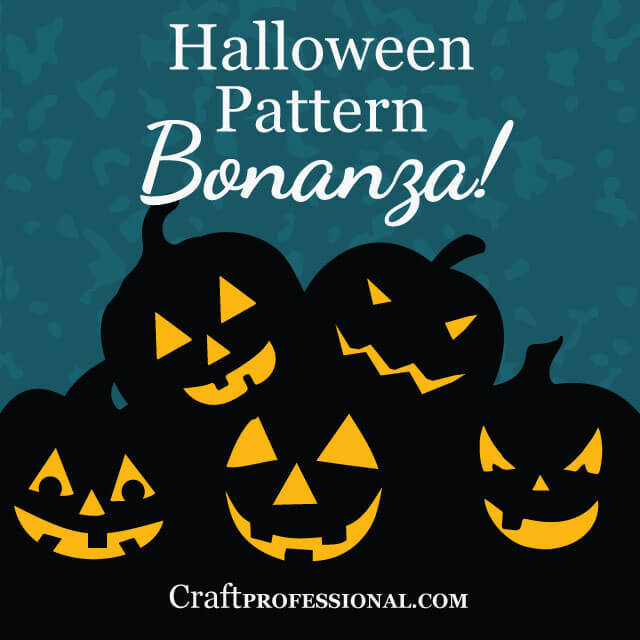 Get ready for Halloween with 50+ Halloween patterns from talented Etsy sellers. Not dressing up to trick-or-treat? Check out these shops are excellent examples of how to turn your original designs into patterns to sell online. This week, we study current holiday retail industry trends to learn what motivates Christmas shoppers this year. You can use those trends in your holiday promotions to give your customers exactly what they are looking for to have a more prosperous holiday sales season. 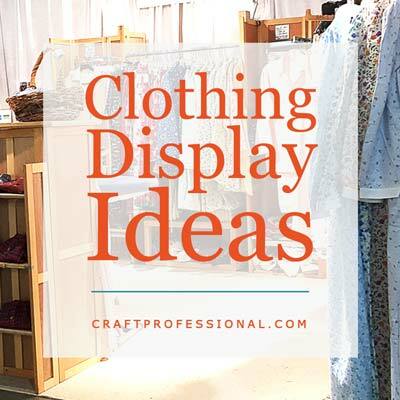 Get your craft booth ready with with 20+ photos featuring clothing displays, food booths, and displays using portable pedestals. Getting started with social media marketing can feel daunting, but you shouldn't miss out on the huge business benefits social media can create just because you have a little to learn. 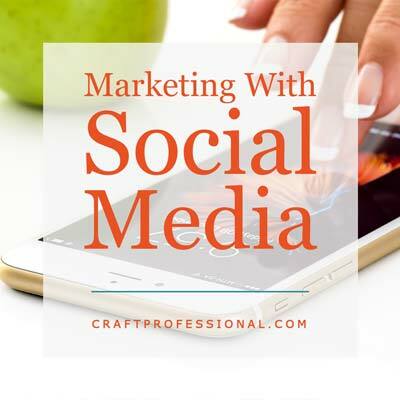 This week we look at how to develop a social media marketing plan that's realistic, plus tools to help you create social media optimized images quickly. Discover whether Instagram marketing is right for your business, and learn how to grow your presence on Instagram without resorting to spammy tricks that put your account at risk. 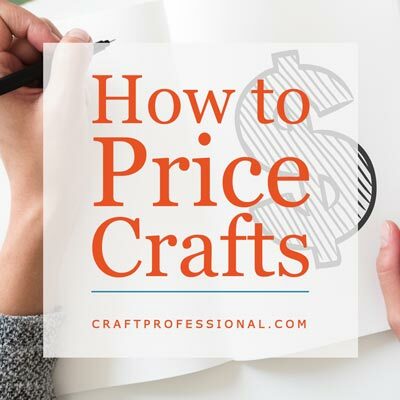 Pricing your crafts can be tricky business. You need to move beyond the emotional connection you have to your products, run the numbers to see what you need to charge to really make a profit, understand how your prices impact your business goals, determine what your target customer is willing to spend, and tie all of that information together into a decision about your product pricing. 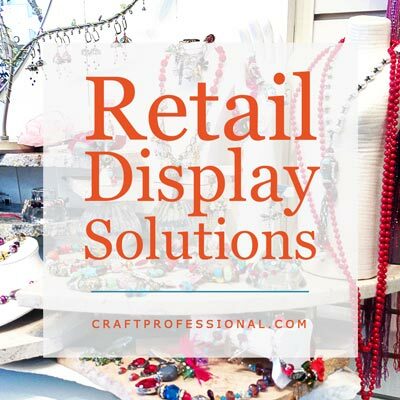 Independent retail shops can be fantastic sources of inspiration for craft display ideas. This week, I'm sharing some fantastic retail display photos, including one of my all-time favorite displays. The most valuable resource most solopreneurs have is also the resource we tend to undervalue the most. Discover the most precious business building resource for solopreneurs, and make sure you use it effectively to grow your business. 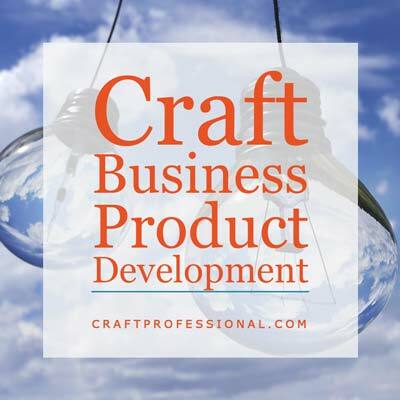 In this three-part product development series: Discover how to assess your business ideas, choose the product idea with the best potential for success, test your concept, and learn from your competition. Here's the printable planner that helped me triple productivity this year. Committing to use this planner is one of the best decisions I've made. Do You Have a Hobby or Business? 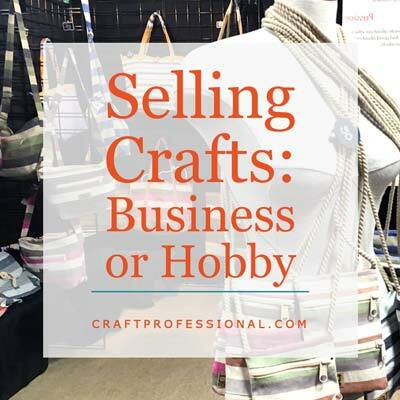 Have you ever stopped to consider whether you have a craft business, or if you sell crafts as a hobby? Either option is perfectly valid, but you should know exactly what you aim to accomplish with your venture. What happens when you put a career advisor in a craft tent? You get a craft business writer who has been sharing tips for building a creative business since 2007. 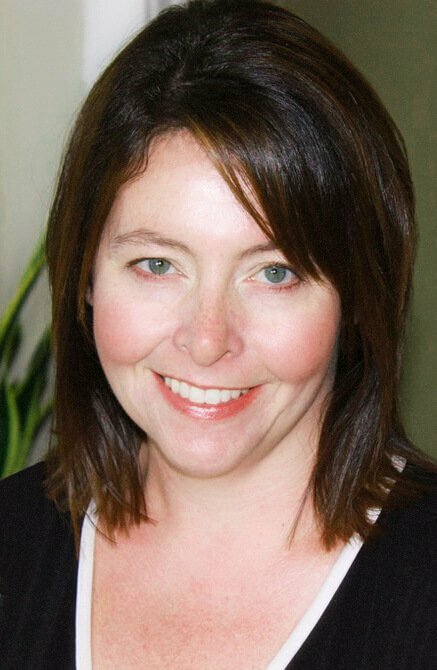 Lisa McGrimmon is the founder of CraftProfessional.com. Read more about Lisa here.